Martin Luther biography, the story of the German monk who challenged the authority of the Church and set off the Protestant Reformation. Martin Luther was born on November 10, 1483, in the small town of Eisleben in eastern Germany. His parents were from peasant stock, but had high ambitions for their intelligent, eldest son. Luther's father, Hans, started out as a miner, but by Martin's birth had become the owner of several foundries. Young Luther was sent away to boarding schools in various towns nearby to study. The curriculum during the late Middle Ages was Latin and church liturgy and doctrine. Discipline was severe: pupils were caned for misbehavior and not learning their schoolwork. Martin was a good student and he went on to the University of Erfurt, earning Bachelors and Masters degrees in Theology. He was in his first year of Law School in Erfurt when an incident occurred that would change the course of European history. On a stormy afternoon in July, 1505, Martin Luther was walking along a country road on the way back to his college. Suddenly, a bolt of lightening hit the ground near his feet. In his terror, he cried out to St. Anne, vowing to become a monk if he survived. Two weeks later, Luther joined the Augustinian Order in Erfurt; his father was furious. Many Christians of the late Middle Ages had a great fear of demons and devils, and were terrified of ending up in hell. Mortality rates were high and life was very uncertain due to disease, accidents, childbirth and wars. Luther shared those fears and his first years in the monastery he was tormented with the idea that all men were hopeless sinners in the sight of God and unworthy of salvation. Some years later, his view changed and he came to believe that Christians could be saved only by true repentance and their faith in Christ's promise of salvation. He rejected the doctrine that acts of penance and good works were the keys to heaven. "Look here, if you expect Christ to forgive you, come in with something to forgive- parricide, blasphemy, adultery -instead of all these peccadilloes." Partly for this reason, he was sent to teach theology at the University of Erfurt, and in 1511, at the University of Wittenberg, where he received his Doctorate in Theology. 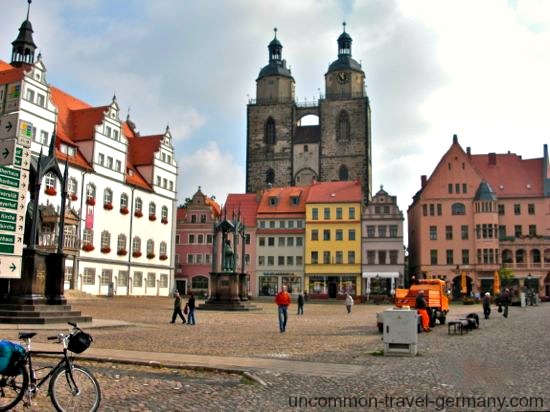 In Wittenberg he was also the parish priest assigned to minister to the citizens of the town. A major source of church funding during this period was the sale of indulgences. An indulgence was a "get out of purgatory card" that could be obtained for oneself or others by paying a certain sum to the church. At this time, the local prince, Frederick III of Saxony (The Wise), had been granted permission from the Pope to sell indulgences in Wittenberg to raise money for a bridge over the Elbe. The soul from Purgatory springs"
and telling them their loved ones were crying out to be released from suffering. Martin Luther was sent to Rome in 1510 on an errand for his order. 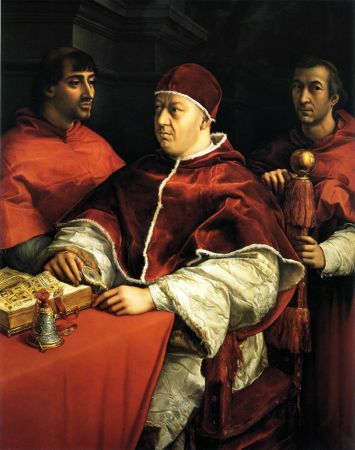 He was shocked by the lack of morality and piety of the local clergy and by the luxurious lifestyle of the Pope Leo X, a member of the Medici family. Pope Leo was known for his expensive tastes and was fond of hunting, gambling and carnivals. The papacy was at a low point in its history and others had been calling out for reform prior to Luther. Martin Luther was a theology professor at the newly-established University of Wittenberg and had been spending a good deal of his time reading the Scriptures and writings of the early Christians, especially St. Paul and St. Augustine. He came to the conclusion there was no evidence in the Bible for believing the Pope had power to release souls from Purgatory. Therefore, he felt the pieces of paper being sold to escape Purgatory were worthless and pious Christians were being scammed. The fact that the funds were going from poor German peasants to wealthy Roman clergy made the fraud even more disturbing. He wrote out a list of his objections to the practice; he named 95 issues he wished to dispute. 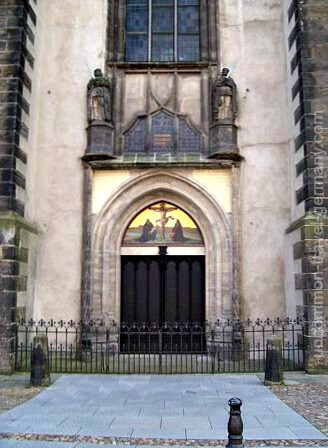 On October 31, 1517, Luther nailed his ninety-five theses, or points of discussion, on the door of the Castle Church in Wittenberg. The document was in Latin and invited other scholars to debate the statements set out. This was the normal way to offer topics for formal discussion in a community of scholars, so the act of nailing the paper to the door was not revolutionary. However, the topic was a touchy one. Indulgences were a major method of fund-raising for the Church. (Medieval Bingo, as author Roland Bainton, in Here I Stand, put it!). The 95 Theses were translated into German and widely distributed throughout Germany, courtesy of the printing press. There is some question about whether the list was actually attached to the church door. Phillip Melanchthon, Luther's closest ally, described the event in a writing after Luther's death and recently another writing of a contemporary has come to light which also states the theses were nailed to the door. Luther never mentioned it in his own writings. There is no question, however, that Luther wrote the list and sent a copy of it to Prince Albert of Mainz. The protest against the indulgences set off a conflagration which, step by step, resulted in most of Northern Europe breaking away from the authority of the Catholic Church. The reaction of the Church initially was to try and suppress the attack on indulgences by suppressing Martin Luther. Pope Leo directed the head of the Augustinians to: "quench a monk of your order, Martin Luther by name". He also allegedly remarked, "Luther is a drunken German. He will feel differently when he is sober". However, because of the complex politics of the time involving the Holy Roman Emperor, Spain and France, the Pope couldn't afford to alienate the German princes. Some of the princes were sympathetic to Luther and German resentment against sending money to Rome was on the rise. The Pope, directly and through churchmen supporting him, told Luther he was wrong, but would be forgiven if he backed down. Luther became more adamant and started adding new complaints about the Church. A flurry of pamphlets and tracts issued from both camps attacking each other. The Pope wanted to bring Luther to Rome and deal with him, but the German princes, including the Holy Roman Emperor, Charles V, said Luther should be given a hearing on the issue in Germany. A debate was held in Leipzig, with Luther challenging the authority of the Pope to decide doctrine and maintaining that many church practices, including most of the sacraments, were bogus because they conflicted with Scripture. It was clear by this time that there could be no coming together on these issues, since the very authority of the Pope was called into question. Luther had made himself very unpopular with the Church. The Church did act to curb the worst abuses of indulgences, but it was too late. The debate had moved far beyond that. See Protestant Reformation for a list of the doctrinal differences between Luther and the Church. Pope Leo sent Luther a notice that he would be excommunicated unless he renounced his heretical views within 60 days. Luther responded by publicly burning the letter, or "bull" in Wittenberg, along with a stack of Church writings. "Unless I am convicted by Scripture and plain reason -- I do not accept the authority of popes and councils, for they have contradicted each other -- my conscience is captive to the word of God. I cannot and I will not recant anything, for to go against conscience is neither right nor safe. God help me. Amen." The printed document released after the Diet of Worms also contained the famous words, "Here I stand, I can do no other." Luther was allowed to leave Worms, but he was now considered an outlaw. Emperor Charles issued the Edict of Worms, declaring Luther a heretic and ordering his death. Frederick the Wise of Saxony favored Luther and arranged for him to be "kidnapped" and taken to Wartburg Castle near the town of Eisenach. 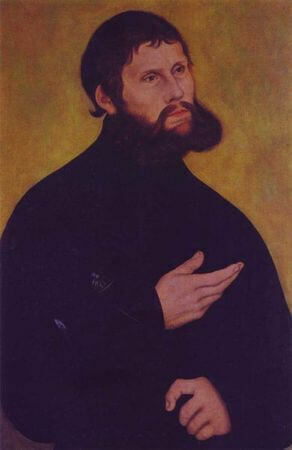 Luther disguised himself as a nobleman, grew a beard and called himself "Junker Jörg". 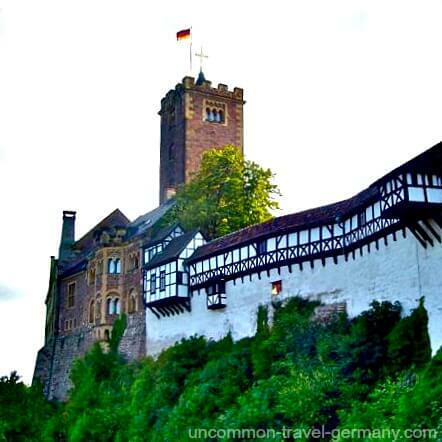 He was safe in the Wartburg, a strong fortress on the top of a mountain, under the protection of the local prince. He spent nearly a year there, writing furiously and fighting depression and numerous physical ailments. It was in a small study in the castle in 1522 that he translated the New Testament from Greek into German and profoundly influenced the form and standardization of the German language. Back in Wittenberg, in Luther's absence numerous leaders had sprung up, each with his own interpretation of doctrine, and most having far more radical views than Luther. Priests wore ordinary clothing and grew their hair, services were performed in German, monks and nuns were leaving the cloisters and getting married. Some groups were smashing images and statues in the churches and dragging priests away from the altars. Luther was becoming more and more alarmed at these reports. 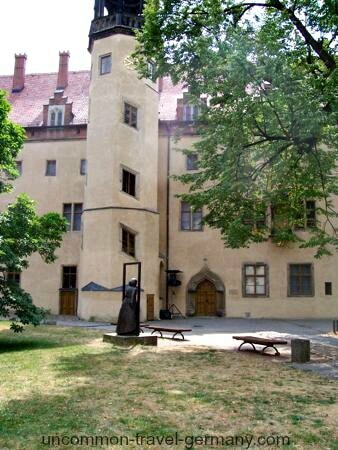 When the town council of Wittenberg wrote to him, begging him to come back and restore order, he decided to leave the safety of the Wartburg and return. He did manage to quiet things down when he returned to Wittenberg. He convinced a couple of the more radical preachers to stop preaching or leave town. Luther began the process of laying out what he believed to be the proper conduct of church services and started writing books to be used to educate the clergy and lay-people about the "correct" way of behaving and worshipping as Christians. One of the problems confronting Luther when he returned was the question of what to do with all the nuns who had run away from the nunneries, including twelve who had been smuggled out in herring barrels. Apparently in the Middle Ages they couldn't be allowed to remain single, so Luther worked to find husbands for them. Finally, only one woman was left, 26 year-old Katharina von Bora, the daughter of a poor nobleman. She had been sent to the nunnery at a very young age, probably because her father couldn't afford to provide her with a dowry to marry her off. Luther picked out a disagreeable, elderly man for her. 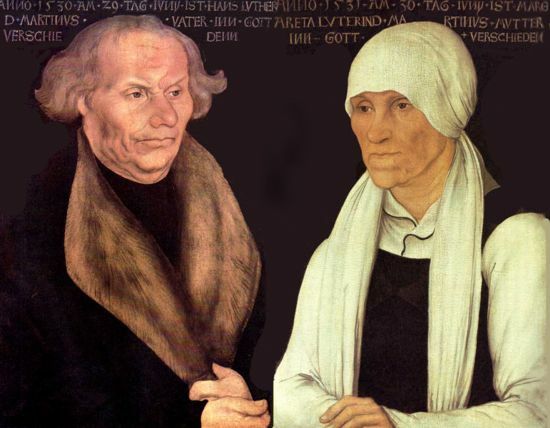 Katharina refused and said she would marry either Luther or another local bachelor. Luther, who was 42, had stated many times he wasn't going to marry. However, he impulsively announced he was marrying Katharina von Bora, to the great surprise of his friends. 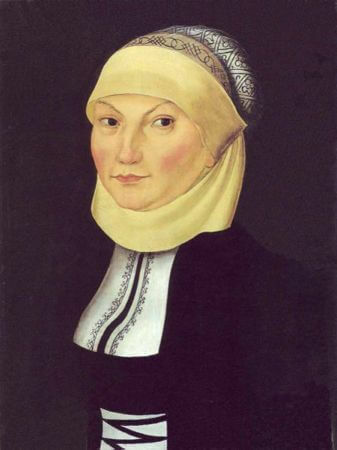 Luther was very fond of Katharina, referring to her as "My Lord Katie" or "My rib". In a letter he addressed her, "To my beloved wife, Katharina, Mrs. Dr. Luther, mistress of the pig market, lady of Zulsdorf, and whatsoever other titles may befit thy Grace." For a long-time bachelor, married life was quite a change, He wrote, "There is a lot to get used to in the first year of marriage. One wakes up in the morning and finds a pair of pigtails on the pillow that was not there before." The marriage turned out to be a happy one and they had six children, three girls and three boys, during their time together. See quotes for Martin Luther's sayings on life and love. There had been periodic unrest involving the German peasants over the years and conditions had been getting worse for them due to some changes in the way land was held. Many were inspired by Martin Luther's challenge to the authority of the Church to challenge the secular powers as well. Luther was initially sympathetic to their struggles, but as the movement gained momentum, some of the groups became violent and were roaming the land looting and killing, robbing and burning monasteries, abbeys and castles. Martin Luther wrote an appeal to the aristocrats to restore order by force. The peasants were disorganized and poorly armed and were no match for the knights and heavily armed soldiers. They were slaughtered by the thousands and their leader Thomas Müntzer, beheaded. Both sides were angry with Luther: the nobles blamed him for stirring up the people and the peasants blamed him for encouraging the nobles to use violence against them. Martin Luther spent the rest of his life in Wittenberg, preaching the new doctrines and creating an enormous body of written work. He wrote many books on Protestant theology, instructional books for Christian worship and living, as well as hymns for congregations to sing during the service. Many are still being sung today; the most famous is A Mighty Fortress is Our God, which can be sung in English in Wittenberg in the Castle Church itself during certain services. 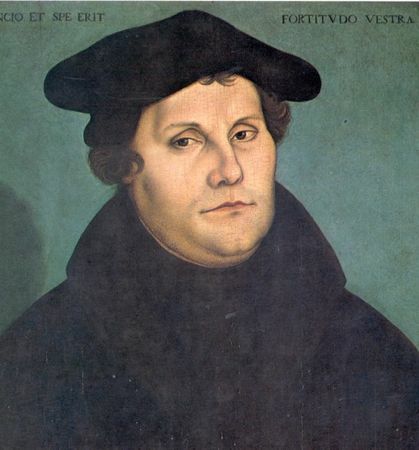 Luther wrote to and met with other leaders of the Reformation, such as Zwingli, to try and produce a unified statement of belief for the reformed church, but nothing came out of it because they were not able to agree on many of the doctrinal issues. Protestantism spread rapidly over northern Germany and to the towns of Augsburg, Nuremberg and Strasbourg in the south, as well as Switzerland. By the time of Luther's death it was well established, mostly in the form Martin Luther created. Luther had been ill off and on for most of his life and his health had been deteriorating as he got older. 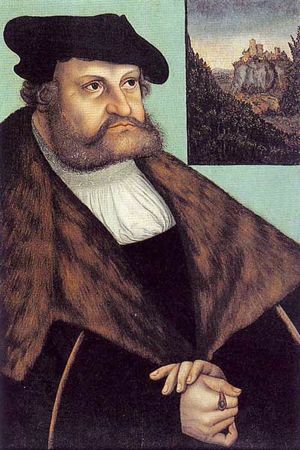 He died on a visit to Eisleben, the town of his birth, in 1546 at the age of 62. 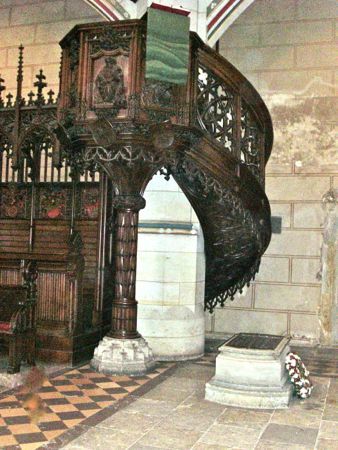 He was buried in the Castle Church in Wittenberg in front of the pulpit where he delivered many of his sermons. His grave is still there. If you want more information on this subject, I highly recommend the Martin Luther biography by Roland H. Bainton, Here I Stand, A Life of Martin Luther. Well-written, with tons of interesting information. For a concise summary of the doctrinal differences between Martin Luther and the Catholic Church, see Protestant Reformation.